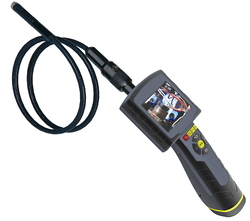 Ideal for automotive, construction and restoration, HVAC/R, and any other inspection of Hand-To-Reach and Hard-To-See areas. 1. Extend Your Hands and Eyes. Users can add buy some vulnerable parts to replace, we also provide other practical choose pay accessories, such as: 30 degrees/mirror / 60 degrees, 45 degrees magnets, hooks. high quality products, Fast lead time, Professional service. Usage: Extend Your Hands and Eyes. Appropriate for use in surveying pipes, equipments, furnishing installation, underwater viewing, parts assembly, construction sites, workshops, laboratories, education, wildlife surveillance, car maintenance and repairing, hard-to-reach areas, etc. 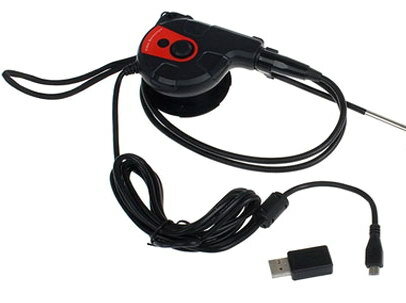 The device can be operated at Windows XP / Vista / Win 7 /Win 8,etc platforms. * Built-in 6pcs LED lights. * Can be operated at Windows XP / Vista / Win 7 /Win 8,etc platforms. * Photo and video recordable after CD driver installation. The appearance is very great, with double color plastic rubber ,one is soft ,the other one is rigid. The display screen is 2.31", packed by the rubber. Extend Your Hands & Eyes! 3.Car repair and maintenance: Inspect and Repair the car frame, chassis, engine etc. 4.Security:security control in Custom, station. Airport etc. 8.Electric equipment and electronic industry: Inspect the production equipment and product’s R&D. 10.Science education and Laboratories: View animal’s in the hole and karst cave. Surface: Double bread plastic mould ,once shaping technique, comfortable hand feeling, perfect surface. Performance: tube is removable, you can change other dia of lens, the light of the LEDS is adjustable, life waterproof. 10.Science education and Laboratories: View animal’s in the hole and karst cave . Check narrow and eys can't extend place. The interior of the machine, car. 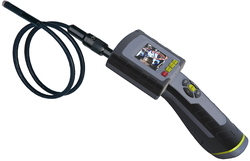 This 3.5" Color LCD Video Inspection Camera use optoelectronic technology to investigate hard-to-reach area. 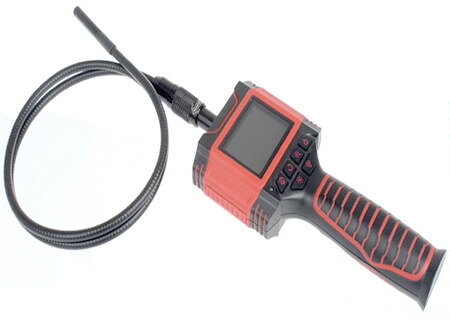 It helps you to diagnose broken part, weld point and released parts easily to save time and increase productivity. 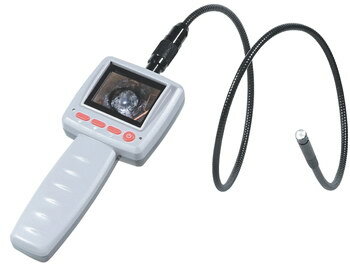 It has built-in 4pcs white LED light (with Brightness Control) on camera head to illuminate the inspection area. The 1 m Flexible tube is Waterproof with 8.5mm diameter , so that you can inspect area under water, gaps and holes. 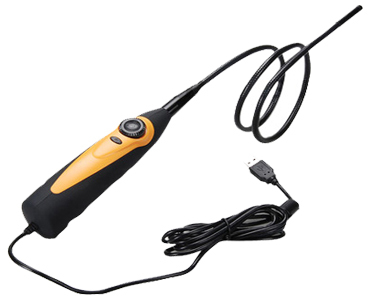 Optional Extension Cable (2m/ 3 m / 5m) allows you to extend the vision of inspection point. Extend Your Hands and Eyes. Appropriate for use in surveying pipes, equipments, furnishing installation, underwater viewing, parts assembly, construction sites, workshops, laboratories, education, wildlife surveillance, car maintenance and repairing, hard-to-reach areas, etc. 11. Let you explore, help you find, fun to use. 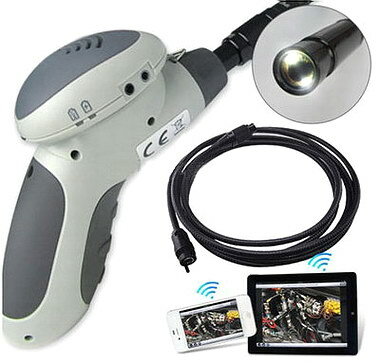 Newest Wi-Fi Borescope supports I phone, I pad, Android, Windows system. 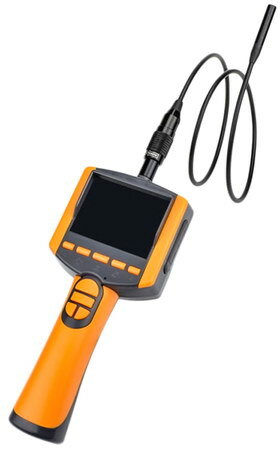 Check hard-to-reach and hard-to-see area with the borescope together with your phone, pc or tablet pc. Several devices operate smoothly at the same time. 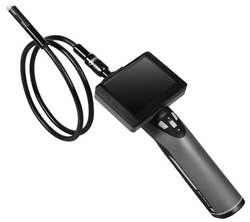 Image Sensor: VGA CMOS Sensor, Sensor area 1/9"
The SRC196 is another newest borescope with professional design and Wi-Fi function, which used with I PHONE, I PAD, ANDROID system and Windows XP,Vista,7,8,etc system. It is the point-to-point signal transferring. More the 5pcs I PHONE or Android devices work or operate meantime. We can take qualified photos, video, and record at the devices. Function: photo, video, storage, etc. 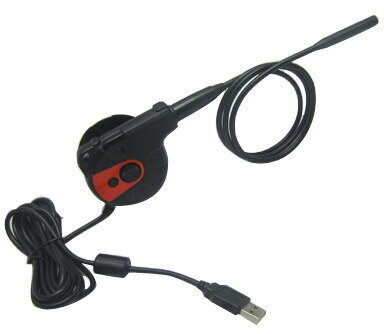 Φ12mm camera cable, tip accessories include magnet, hook, mirror; Φ9mm camera cable, tip accessories include magnet, hook, mirrir and protection cap. SRC363 WIFI video inspection has been designed as a user friendly and economical way of solving hidden problems and increasing productivity. (eg. Inspect vent pipe and system of air conditioner, machine equipment, engine and so on). The unit uses WIFI technology and supports iPad/ iPhone/ Android/ MS NoteBook, and computers with WINDOWS system and wireless network card which comply with IEEE802.11n. The unit allows multiple devices to connect at the same time and displays clear real-time images. Also, you can connect the unit with homely wireless router. 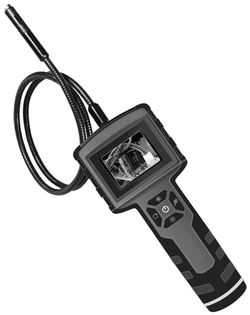 In this way, it is convenient for specialists to interview the real-time image via internet to guide and analyze your inspection. The unit equips with a detachable fixture which can facilitate the installation of the mobile phone. When needed, use the fixture to install the phone above the unit’s grip. 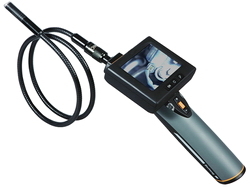 The unit has a probe with the length of 1m and diameter of Φ9mm (customized camera head and probe also available). Four adjustable LED lights set around the camera head help the user to see inside dark gaps and holes. 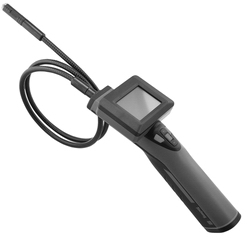 Several accessories can be equipped on the tip of the probe, making it more flexible. 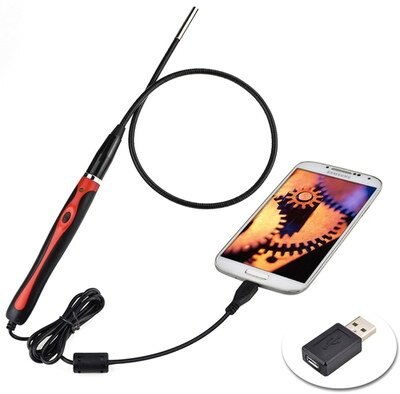 The accessories include magnetic, mirror, hook and screw protector. 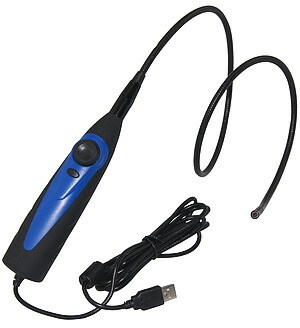 SRC363 has built-in polymer lithium battery, also could use 5V DC adapter or USB port for charging with LED indicator. It has the advantages of small size, stable performance, easy operation and portability. It is widely used in applications such as the industry, the building, the aviation, the vehicles maintenance. 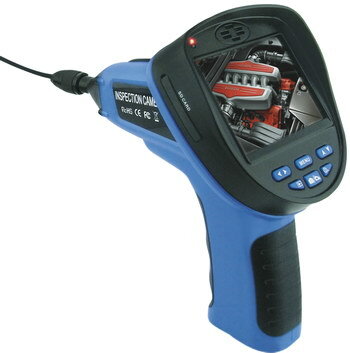 SRC368G5-09 Multifunction video inspection has been designed as a user friendly and economical way of solving hidden problems and increasing productivity. (eg. Inspect vent pipe and system of air conditioner, machine equipment, engine and so on). The product has a high clarity color LCD of 5 ’’ size. 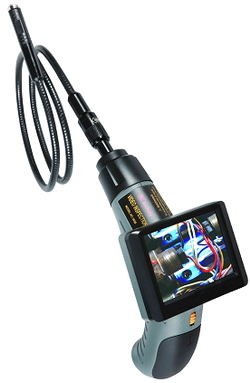 It uses an interchangeable 9mm probe and can be connected to probes with different length and diameter (customized camera head and probes are also available). 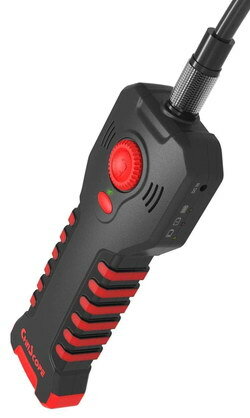 The camera head is with adjustable LED lights, which helps you to inspect gaps and holes. The camera head can equip with several accessories (magnet, mirror, hook etc. ), making it more flexible. SRC368G5-09 can take a photo wirelessly .It has built-in polymer lithium battery, also could use AC adapter for charging with LED indicator. The screen can detach from grip and the grip can control monitor to take photos and videos. SRC368G5-09 has an internal memory (support Micro SD), and is capable to capture videos and take photos both manually and automatically. It has a built-in microphone and a speaker, which makes it possible to record and playback sound. The product has a TV output and a USB port, which allows the users to connect the unit to a TV or a computer. The product also supports image zooming. It has the advantages of small size, clear image, stable performance, easy operation and portability. It is widely used in applications such as the industry, the building, the aviation, the vehicles maintenance. SRC2709 Palm Scope has been designed as a user friendly and economical way of solving hidden problems and increasing productivity. (E.g. Inspect vent pipe and system of air conditioner, machine equipment, engine and so on). 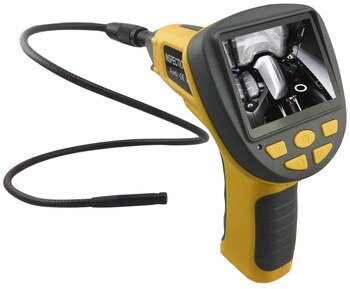 SRC2709 has 2.7 " LCD screen, equipped with camera probe of 9mm head , length 60cm. 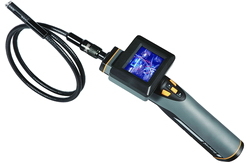 The camera head of the probe has 4 bright LED lights that are nonadjustable, which helps you to reach gaps and holes. The camera head equips with several accessories including magnetic tip, mirror tip and hook , which makes it flexible. SRC2709 has features of 4X image zoom and 180°image rotation. The camera probe adopts unique patent structure which designs the camera probe in a built-in style. The product uses TPR and equips with safety sling and nylon bag which has a hanging buckle. It also has the advantages of small size, stable performance, easy operation and portability. It is widely used in applications such as the industry, the building, the aviation, the vehicles maintenance. 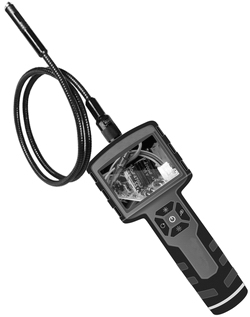 The probe are IP67 water-proof. Transmit real-time image to computer. Package: Blister + Color Card. The camera head and probe are IP67 water-proof. 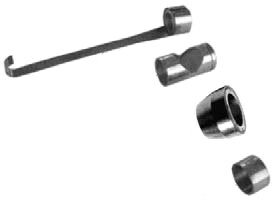 1, Φ12mm head accessories include magnet, hook, mirror; Φ9mm head accessories include magnet, hook, mirrir and protection cap; Φ5.5mm head accessories include guilding ball, mirror and protection cap. Use 9V alkaline battery (not included). SD card not included; Support up to 16G. Use 4 * AA batteries (not included). Live View from computer; Connect receiver box to computer and software included. 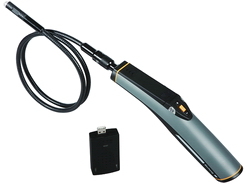 With rechargeable lithium battery and adapter (included). 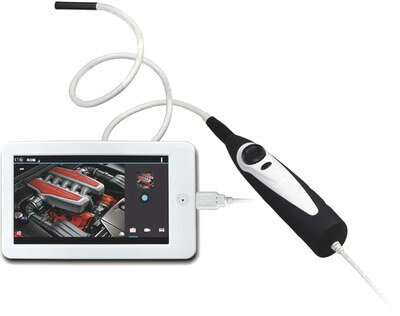 Screen and grip with rechargeable lithium battery and adapter (Included).